Walk of Faith There are 4 products. Walk of Faith is the first in a six-volume series. It is a study of Hebrews 11. It is made up of 17 weekly lessons designed for Jr. and Sr. High students to encourage them in Biblical truth and spiritual habits. The sample pack is a spiral bound book that gives you a sample and overview of the lesson, teacher's tools, Summit Award, student journal and more. Walk of Faith is the first in a six-volume series. It is a study of Hebrews 11. It​ is made up of 17 weekly lessons designed for Jr. and Sr. High students to encourage them in Biblical truth and spiritual habits. 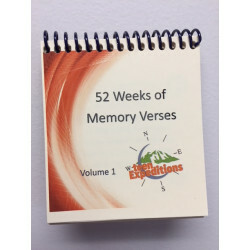 The Walk of Faith memory verse pack comprises 52 memory verses. There are two verses each that coincide with the 17 lessons taught throughout the year.